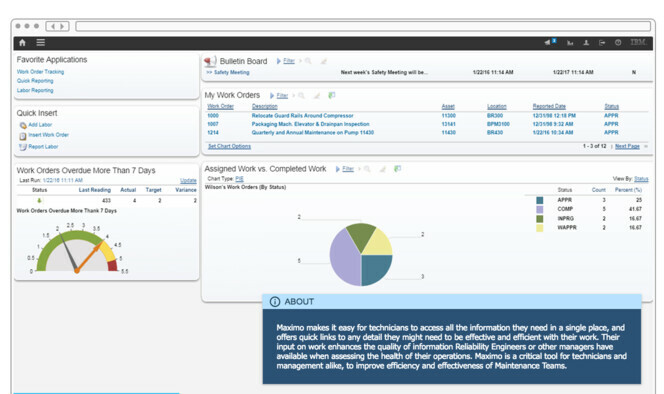 IBM’s Maximo is an enterprise asset management software which has comprehensive CMMS (Computerised Maintenance Management System) capabilities. The maintenance app is best suited to manage complex maintenance management requirements within asset intensive industries. From line maintenance to complex assembly maintenance, Maximo is a proven product with over 100,000 users. Its top users are from Utilities, Oil and Gas, Nuclear Power, Transportation, Aviation and Life Sciences industries. The starting price point for Maximo is from £131 per user. The maintenance app is available as either a cloud-based or web-based system and also comes with an on-premise installation. Maximo’s equipment maintenance capabilities can be implemented in approximately 20 days. Get instant visibility into the usage of your equipment and machinery across multiple sites. Improve the uptime of your equipment by as much as 20%. Optimise your inventory costs by as much as 30% by leveraging maintenance, production and supplier related information from a single place. Enhance the life of your enterprise assets by as much as 5%. Use your equipment data by importing (csv), integrating or directly using equipment data in Maximo. Equipment parameters such as speed, vibration, temperature and inlet/outlet pressure can be easily used within Maximo. A single “go-to” asset register to record all details of your assets. Describes the capabilities and details of your equipment and machinery. Configure and manage relationships between assets. Get an individual view of your equipment or a view within a workflow or process. Plan time based, interval based, condition based and industry (perspective) based planned and preventative maintenance programs. Create job plans for an asset, location or a process. Define maintenance tasks which include details of labour/workforce, materials, services and tools. Create work orders based on Time Based Frequency or Meter Based Frequency. Define the sequence of your preventative maintenance activities. Manually upload and import equipment data to create your work order. Reliability engineers can quickly take decisions on under-maintained and over-maintained equipment. Create work orders that are based on condition, pre-defined threshold limits, process change or for reactive maintenance. Provide detailed instructions within your work order, and assign resources based on competence and availability. Define work order sequence, approval chain and final-sign off parameters. Create safety plans for work orders. Easily compare actual vs planned work order costs. 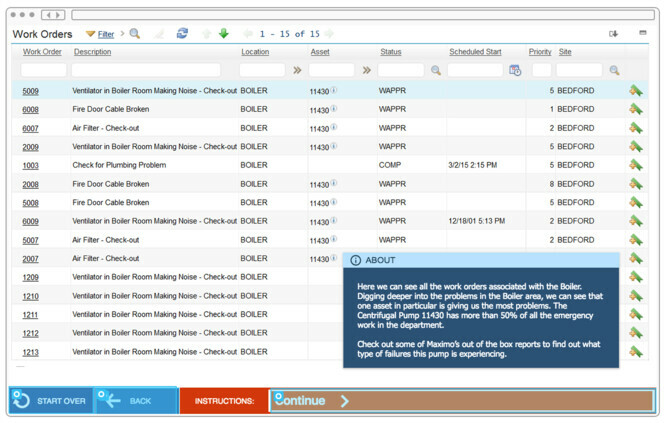 Add inspection documents, invoices, delivery receipts and other related documents to your work order. Graphical scheduling in a GANTT Chart format. Easily understand demand of work orders against available resources. Easily Assign, Deassign and Reassign work orders to correspond with the dynamic nature of your resources. Define purchasing workflows based on site/location and inventory. Configure straightforward purchase situations to running multi-vendors and multi-site RFQ process. Manage prices, payment schedules, service level agreements, terms and conditions with contracts and its revisions. Enter the parameters, service level agreements and deliverables of the signed-off contract. Relate assets, labour (workforce) and contracts. Create invoices based on defined contract rules. Designed to report on the reliability and status of your equipment and machinery. Instant high level and detailed view of the status of your assets. Easily identify anomalies at process, plant and equipment level. 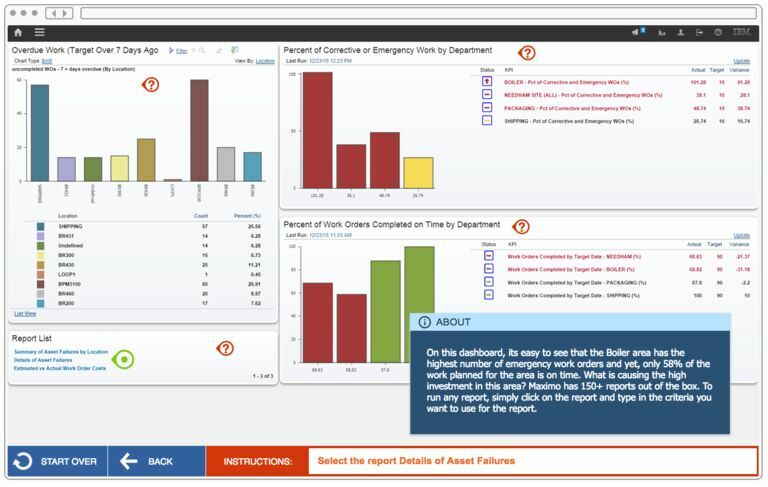 The detailed view of the asset status is designed to offer actionable insights. Define baseline, operating, threshold, warning and dangerous limits for all your assets. Maximo SaaS – This is a public cloud solution which means your data will be hosted on a server that also has data from other businesses. It is designed for small businesses with moderate maintenance management requirements. The starting price point is £131 per user. In addition, it can be implemented without any external help and it has limited configuration options. This product does not include any industry specific capabilities. Maximo SaaS Dedicated – This is a private cloud solution and a fully configurable product designed for medium to large businesses which have complex maintenance management situations. SaaS Dedicated has industry specific capabilities. The product is deployed by IBM or one of its partners. Maximo On-Prem – This is an on-premise solution implemented by you. You can also choose one of IBM’s partners to conduct the deployment. The on-premise version is also designed for medium to large organisations with have complex maintenance requirements. Implementation Methodology: The product is implemented by IBM or one of its partners.